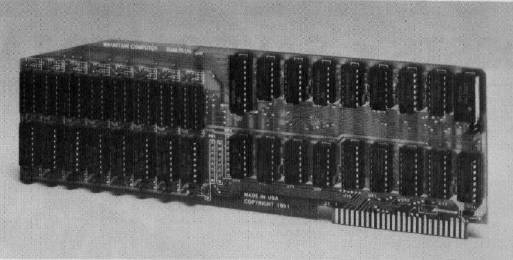 Scotts Valley, CA — Mountain Computer has just released a new dual 16K RAM card for the Apple II®. Two banks of 16K selectable RAM expand the Apple to 80K of available memory. The second bank of 16K RAM is controlled by user-supplied software. Hardware and/or software selection of each 16K bank of RAM is controlled by the user. The card also provides its own refresh circuitry. Card installation is simple, just install it in any I/O slot. When RAMPLUS + is in Slot 0, it emulates an Apple Language Card® and you can install multiple RAMPLUS + cards into the same Apple II. Status includes the area and bank of RAM selected, READ, READ or WRITE operation, and ROM Enable or Disable information. The card is supplied with 16K of installed RAM for $189.00 The additional 16K of plug-in RAM costs only $24.95. RAM diagnostics have been developed (on diskette) and are supplied with the product.